Did Thursday’s 26 Floral Street Style Looks inspire you to mix in a bit of floral lovin’? Even if you’re not ready for a full-on floral dress (and really, who am I to talk), you could try it out with a tank or hey, a thong. I’m thinking a floral iPhone case would work for me. I do love looking at these though, even if I’m not wearing them. So fun. If you love the floral-print shoes (I’m slightly obsessed with the Loeffler Randall pair here, and the Jimmy Choo floral-printed python platform), you can also check out my floral shoe roundup, “Petal Power” in Sunday’s Boston Globe. 1 Matthew Williamson Peach Floral Facet Tee, Ssense. 2 Ray-Ban Original Wayfarer, Piperlime. 3 Kate Spade Maryanne Floral Fiesta Bag, Saks. 4 Canopy Floral Pencil Skirt, Ruche. 5 Jagger Edge Spring Fling iPhone 5 Case, Shopbop. 6 Floral Print Leggings, Alexander McQueen. 7 Stone Mix Necklace, J.Crew. 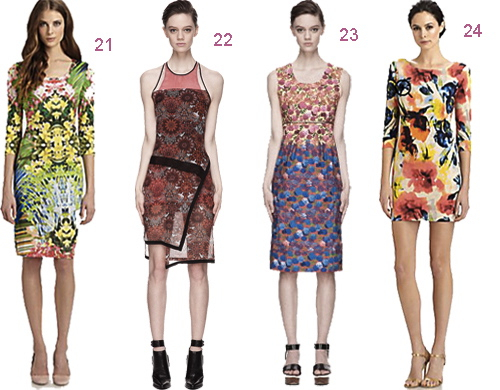 8 Versace Silk Floral Tank Dress, Ssense. 9 3.1 Phillip Lim Racerback Tank, Otte. 10 Baku Mi Amor Floral High Waist Bikini Bottom, Asos. 11 Prabal Gurung All Over Flower Tee, Kirna Zabete. 12 Infatuation Floral Print Dress, Ruche. 13 Silk Tee in Mai Tai Floral, J.Crew. 14 Desert Floral Racer Tank, J.Crew. 15 Dahlia Platform in Tucker Floral Linen, Loeffler Randall. 16 Sloane Platform Sandal, Rag & Bone. 17 Felina Charming Lace Thong, Bare Necessities. 18 Floral Printed Canvas Hobo Bag, C.Wonder. 19 Floral Print Ballet Flat, Old Navy. 20 Liberty PopOver in Floral Eve, J.Crew. 21 Elie Tahari Barbara Silk Orchid-Print Dress, Saks. 22 Helmut Lang Floral Mandala Asymmetric Dress, Ssense. 23 Marc Jacobs Belted Floral Dress, Ssense. 24 ABS Floral Print Jersey Dress, Saks. 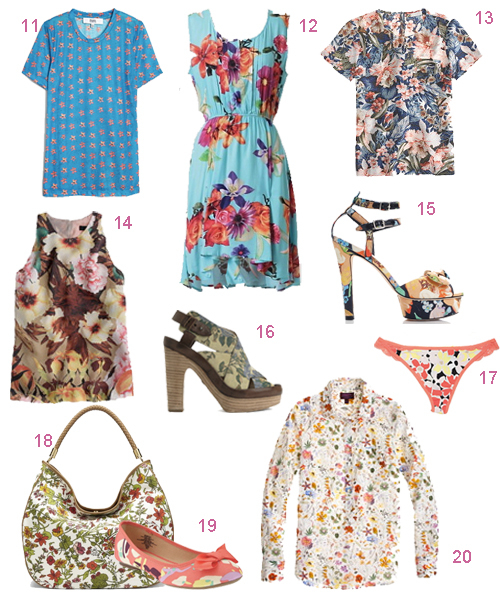 Shop 500+ floral pieces at Shopbop.